An indication of the low crop levels we experienced in 2003 is evident when one considers the production of our 2003 flagship Finn cuvee. Frost incidence in early spring, followed by unsettled weather at bloom, and finally heat at harvest, had the combined effect of lowering crop levels by 56% from 2002. Additionally, berry size was small, leading to low juice yields but thankfully great natural concentration. For the first time the two vineyards that historically comprise this blend, ripened, were harvested and subsequently fermented together. Co-fermentation offers the prospect of earlier and complete integration of the blend components, but should only be undertaken when one has complete confidence in the vineyards concerned, borne out of working closely with them over a number of years. Furthermore, one sees the enhanced synergy that results in the final wine from an early stage, affording the opportunity to fine tune later barrel aging techniques. 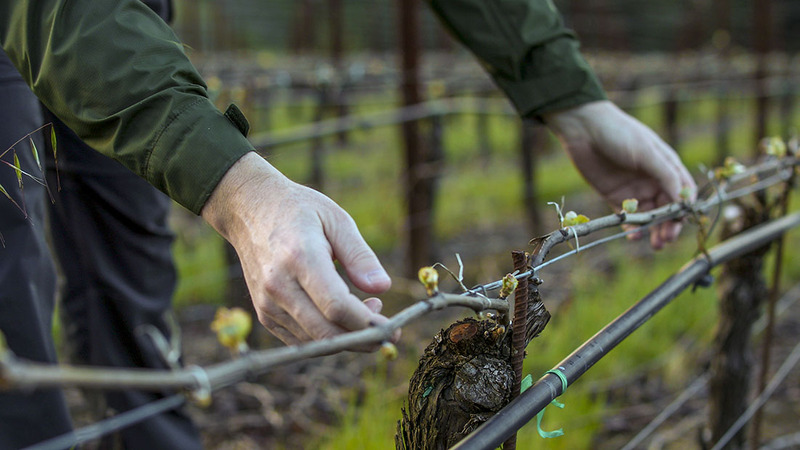 In the field the Occidental Vineyard offered typically expressive Burgundian flavors and structure, whereas our historically favorite section of the Widdoes Vineyard was more Californian in its soft, rich elegance and more succulent style. The combination is one of balance, concentration and intensity and shows a clear heritage back to the debut 2000 vintage, to which I would compare it most closely. In the cellar the wine remained undisturbed for fifteen months in barrel on the light lees without racking. This technique keeps the wine in a slightly backward state so that it may fully blossom in bottle, enhancing aromatic complexity and favoring finesse. Although there is not much to go round, I hope you get a sense of the passion, which goes into the final wine. Medium ruby red that darkens with aeration. Explosively aromatic nose of black cherry, flowers, minerals and smoke. Great inner mouth perfume and nuance with concentrated blackberry, violet and redcurrant flavors, supported by peppery spice and sweet rich tannins. Great length on a vibrant sappy, yet seductive finish. Drink over the next five years.